On last Thursday evening our trustees voted that our church would be closed to the public and non-church events after sundown each day. It will reopen daily at sunrise. This action followed several months of worsening problems with crowds of unsupervised persons on our property after dark, and after incidents in our nearby neighborhood indicating that the levels of this activity were becoming a real problem. This has been caused by destructive behavior and disrespect to our church property and our neighbors. This was caused by the behavior of a small number of people, but their continued reckless activity put themselves and others in danger, and there has been disregard to warnings. Many of these were students from various schools in the Over the Mountain area who apparently have planned large gatherings without permission in our parking lots, but it has also included older young adults. The trustees are investigating additional security measures, but this is in effect immediately and the police have been informed that after sundown they may remove visitors from the grounds. It is unfortunate to have to take this step, but it is a matter of public safety and respect for a place of worship. Most people who come to our property are respectful and appreciative and we continue to welcome them during daylight hours to enjoy this space. Those who come for the wrong reason will be removed. 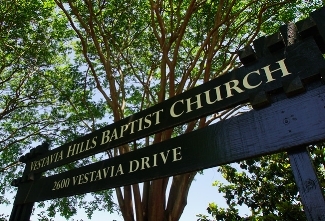 Thank you for helping us keep this beautiful place, and all concerns about unauthorized presence on the property after sundown should be reported to the Vestavia Hills Police immediately.